Small-Block Modified Feature Finish (30 laps): DUANE HOWARD, Craig Von Dohren, Richie Pratt Jr., David Van Horn Jr., Frank Cozze, Michael Maresca, Alex Yankowski, Demetrios Drellos, Cale Ross, Louden Reimert, Brad Roberts, Matt Stangle, Ryan Anderson, Roger Manning, Kevin Sockriter, Norman Short, Michael White, Scott Van Gorder, Jeff Strunk, Billy Pauch Jr., Roger Henion Jr., Stewart Friesen, Mike Gular, Clay Tatman, Dylan Swinehart, Joseph Watson, H.J. Bunting, Ryan Watt, Jordn Justice, John Willman, Brian Hitz. Did Not Start: Andy Bachetti, Matt Sheppard, Wade Hendrickson. RUSH Late Model Feature (20 laps): MICHAEL DURITSKY, Ross Robinson, Dale Hollidge, Amanda Whaley, Tyler Reed, Derek Magee, Joe Pete, Wes Clifton, Jonathan Raley, Billy Thompson, Jason Dean, Nick Davis, Zac Weller, Charles Shawver, Ben Scott, Ryan Frazee, Matt Glanden, Mike Wharton. Did Not Start: Matt Hill. Delaware Super Truck Feature Finish (12 laps): ROBERT SMITH, Matt Esham, Jerry Hill, David Smith, Dale Elliott, Mike Kennedy, Kurt Miles Sr., Kurt Miles Jr., George Shupp, Bo Beauchamp, Bill Dean. 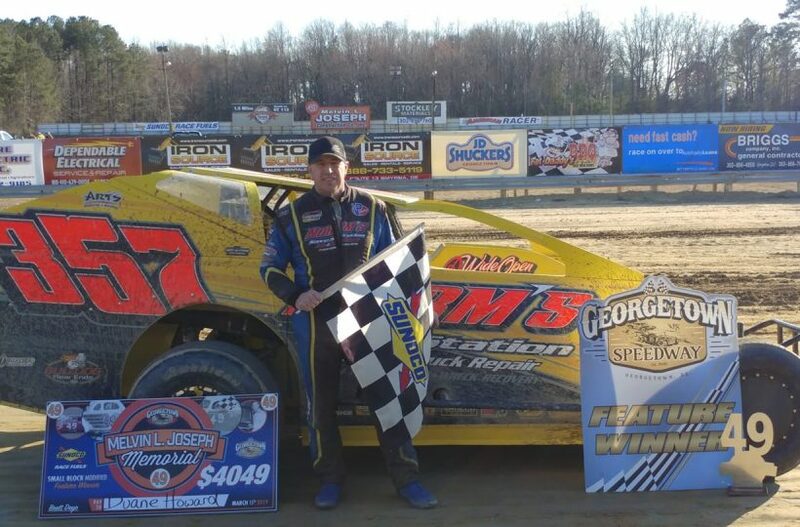 Delmarva Charger Feature Finish (12 laps): ASHLEY MERRITT, Derek Swafford, Chris Carroll, Randy Merritt, Joe Waters, Brandon Riefler, John Bailey, Robert Paczkowski, Geoff Carey, Chris ‘Tippy’ Martinez, Joe Morrell, Jarett Chandler.